Monday Teena and I arrived in Mont Tremblant and after checking in to our hotel, le Kandahar, we headed over to Microbrasserie La Diable (Microbrewery La Diable). Teena's review of La Diable is here. 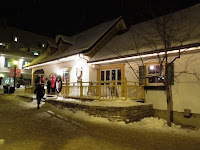 La Diable is owned by two men, André Poirier and Pierre Jasmin, and has been running since 1995. They brew five year round draught beers plus one cask. They also brew a Beer of the Month. While we were there, I had three of their beers. The first one (pictured left) was their Real Ale, a cask ale which is unfiltered, dry hopped and, of course, served using a beer engine. The website says it is a red ale, which I don't usually enjoy, but I liked this one. I always enjoy the hoppy, floral fragrance brought about by dry hopping. The beer which comes in a 4% APV, starts just a little watery before the hops come in. It has a pleasant slightly bitter finish. This beer shows that light beers can have flavour. An enjoyable session ale for sure! Next up was their Beer of the Month, which I was very pleased to find was an IPA. I was quite looking forward to this one. The problem was there was very little hops used in this one. I believe they toned this IPA down to suit the tastes of the tourists in the area, which is quite smart. This is not a beer that would offend the everyday big brewery beer drinker and may turn people on to craft beer too. For me, this IPA was a disappointment. One note is that they do make an 8.5% Trappist style ale that beer geeks may enjoy. I just wasn't in the mood for one when I was there. The third beer I had was their Double Noir, a 4.5% stout. It too starts off a little watery but then the flavour of the coffee comes through, with perhaps a little chocolate. This is a very good, enjoyable creamy stout. Of the three I tried, the Real Ale was definitely my favorite. On our last day in Mont Tremblant, Le Diable was the last place we visited. Instead of trying something different, I went straight for that Real Ale. I also noticed that a diagram of the buildings brewery setup was painted on the wall. It was covered by coats when we first visited so I took a shot, then had another Real Ale. It was a great way to finish our stay.